To the Moon, All in or Bust!
" THE sound card Home studio owner"
" Super stable, robust ... serious!" While there's been plenty of lunar references in the many reviews for the new Apollo Twin series that are all over the web these days, the notion of "all in or bust" particularly applies to this review. I turned my entire home studio upside down on the flip of a coin that a new Apollo setup would simplify and improve my workflow. See I had grown quite comfortable and familiar with my surroundings, my 2008 Mac Pro tower, the trusty old RME Fireface UC connected via USB, and my centrepiece channel strip, my old LA-610 from UA. The last of my old setup, the LA-610, was especially the hardest to give up. You only have to read my in-depth review here on Audiofanzine to understand that. But the bottom line was, the setup had become too comfortable, and I had accepted it's limitations for too long. 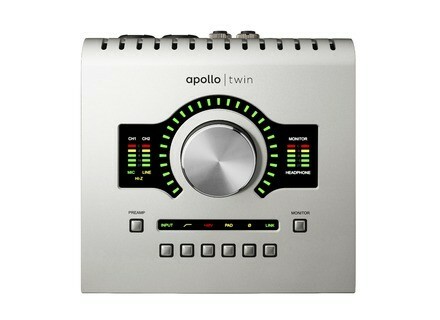 Looking to rejuvenate my recording process, I threw it all out the window for one, small silver box....the Apollo Twin Duo. 1) Are the Tubes done yet?....I do many things in my studio space, music obviously, but also sound design, film editing and graphic design. When a musical idea strikes or a music-related project presents itself, I often only have a narrow window of time to lay it down. Due to the sporadic nature of these projects, having to plan ahead to turn the LA-610 on an hour in advance to heat the tubes up was too much of a headache. Additionally, if my plans changed and I didn't end up being able to record, but had already pre-heated the tubes, I felt like it was such a waste of power and tube life. With the Apollo, I simply turn on the switch, load the exact same preamp module as a plugin in the designated preamp insert point and I'm ready to record. One cable, no wait. But does it sound as good…yes, and I’ll prove it later in the review! 2) Stability and Simplicity- When I started recording as a hobbyist before taking on professional projects, I came up through the ranks of sound cards like everyone else. First was the ol’ M-Audio Fast Track, then on to an Edirol FA-101 and ultimately I settled on an RME Fireface UC. By the time I got the RME, I was taking on professional projects and had a huge appreciation for driver stability and sound quality. But even then, the USB drivers always had quirks with Pro Tools 9 and every so often the RME would go MIA. There was also the minefield that is RME’s TotalMix software that I had to navigate on a regular basis. Configuring inputs and outputs with Pro Tools was always complicated and it was always a nightmare figuring out what sound was being routed where….with Apollo however, this is all automatic. The Console software, works just like a small analog board and it’s routing capabilities are very intuitive. Also, it’s I/O automatically configures itself with Pro Tools. Additionally, because it connects via Thunderbolt, it uses a PCIe driver, that not only blows the USB connection out of the water in terms of data transfer rate, but also in terms of stability. In the first month of regular abuse, the Apollo has yet to loose communication with Pro Tools. 3) Latency - The biggest draw to Thunderbolt is that it matches hardwired, PCIe speeds, meaning recording at lower buffer sizes is feasible with minimal latency. The argument that manufacturers like RME make in this regard, is that in Low-Latency mode, Pro Tools bypasses it’s own output and allows you to monitor solely through the DSP-powered mixer on your sound card, thus in real-time with zero latency regardless of your buffer size. This is true…unless you are using software instruments or guitar emulations. In that case, you will only hear the DI sound from your instrument and won’t be able to monitor with fully processed sound. Apollo makes low-latency recording incredibly easy as well as monitoring with plugins. Because Apollo automatically works with Low Latency mode, there is no configuring and muting tracks to achieve direct monitoring with PT: when you record-arm a track in PT it is simply only heard through Apollo. Because Apollo can load UAD plugins, you can place a preamp, a guitar amp emulation, and even a compressor in the signal path all in real time with no latency before the sound is even sent to PT…that is something no other sound card can do at the moment. You can also have additional Aux sends set up within the console app with reverb and delay plugins in real time to further improve your monitoring experience and ultimately your performance. 4) Hardware controls - The physical design of the Apollo Twin is also a huge upgrade over my old Fireface. Navigating monitoring levels was just too complicated for the Fireface’s tiny numeric display and I found myself constantly adjusting monitor levels with my mouse in the TotalMix window. The Apollo interacts more sensibly. It’s desktop design means it doesn’t have to be tucked away in the rack, but rather it can sit on my desk at arm’s reach. The ability to intuitively switch between monitoring on speakers or headphones is a huge improvement in my workflow. The ability to switch between preamps on the fly and adjust gain and other parameters is also a breeze. It’s no-fuss, no-manual-required operation. 5) One and done…I’ve probably used the words ‘simple’ or ‘plug and play’ in various forms quite a bit so far in this review. That’s because it’s the characteristic that has made the Apollo such an upgrade for me. One Thunderbolt cable and I’m done. I have all of my UAD instances loaded up in my channel strips in real-time, which means top quality processing with zero latency and no laborious patching of cables between physical outboard gear. So what about in use? Below I'll walk through some instances of where I've used Apollo and UAD processing in conjunction with Pro Tools 11 on some recent projects. In a recent soundtrack project I was working on, a filmmaker friend of mine had another friend of his, who is a talented singer-songwriter, record a cover of Neil Young’s “Tell Me Why” to be played over the final credits. While his friend is a terrific guitar player and singer, the recording methods used were less than desired. The vocals were recorded in 16 bit audio on a Zoom handheld recorder, so when it was sent to me for mix-down, I had to be creative. Thankfully, Apollo allowed me to do some clever re-amping, which when combined with some additional UAD processing worked some real magic. In this first audio example, you’ll hear the raw 16 bit vocal takes as they were loaded up first-time in my PT Session. I said before I’d prove Apollo adequately replaced my LA-610. Below is the sample I used in my review of the LA-610 using an Epiphone Viola Bass. Next is a sample using the same bass with the same-preamp emulation, combined with an LA2-A compressor plugin inserted in the Apollo Console app during tracking. In this instance, I was trying to record some vintage Wurlitzer sounds to help drive the rhythm section of a song. Using the Wurly sounds from GarageBand on my iPad, I was able to use Apollo and UAD processing to transform the original, digital recording. 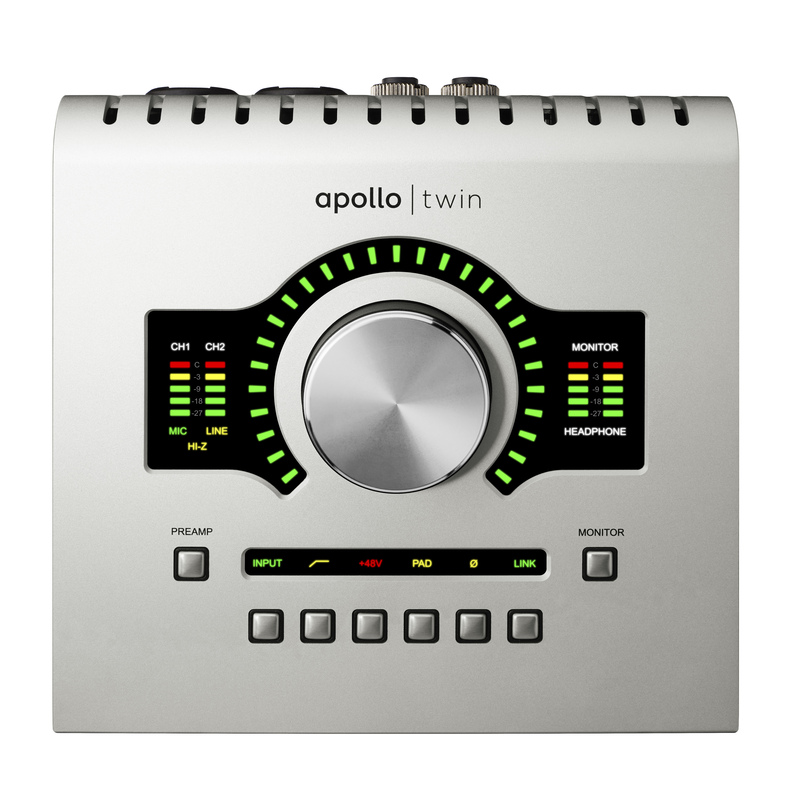 The Apollo Twin is also a dream for guitar players who have struggled with home recording and guitar amp emulations. I took the new Chandler GAV19T Amp emulation for a spin and was blown away with the results. I found I could load an instance of the Neve or UA preamps first to improve the DI Signal and then insert the Chandler to get my amp sound. All of this is accomplished with zero-latency, resulting in the best picking dynamics and playing experience I’ve had with any sound-card/amp configuration. I also love the fact that I could throw a Fairchild 660 after the Chandler, basically giving me a world-class rack compressor with extra tube character. Furthermore, I could choose to monitor only with the plugins and record the dry DI guitar signal into Pro Tools, so I could reamp and maintain flexibility later on in the mix. Even better is the ability to record both the dry and wet! Simply choose to only monitor with plugins, and print your main track dry. Also, simultaneously set up another track in your DAW to record one of the AUX channels. Then, in the console app, send the monitored sound of the amped guitar to the Aux send with no inserts loaded, and the full wet sound will be recorded to that second track. Voila, double tracking and reamping in the box with zero latency! Here’s a good taste of the Chandler plugin, tracked through Apollo with a 610-A preamp preceding it and a Fairchild 660 succeeding it. What about stereo recording acoustic instruments? Sure, why not. I set up to record some Acoustic Slide for a recent soundtrack project, with a down-home, ‘sitting on the porch’ type of vibe in mind. I put an AT4033 on the 12th fret and ran that through the first preamp on Apollo using the 610-A emulation. Using the same preamp configuration in the second channel, I completed my stereo image with an SM57 close miked near the bridge. Here is the same recording, with some additional processing in Pro Tools. Each track was given an instance of Studer tape for some vintage vibe, which was doubled up with some healthy compression from a pair of Fairchild 660s. Pultec EQs were then used to tighten the low end and enhance the top-end. With the tone dialed in, a subtle instance of the Roland Space Echo on each track gave a nice tape slap effect, before the whole performance was pumped with extra grit and attack via a ‘blue-strip’ 1176 compressor. Similar to treating the vocals and the Wurly keys, re-amping through the impedance stage and the Neve 1073 emulation works wonders on digital strings. This composition was performed on 4 tracks using the Strings instrument in GarageBand on the iPad. In this first, dry example the thin, digital sound is evident. In the second example, simply passing the tracks through the 1073 without any added gain or EQ adjustments instantly enhances the stereo image and the organic quality of the composition. In the third example, the additional saturation from the Neve preamps and some broad strokes with the EQ go a long way to overhauling a previously anaemic and digital sound. As I've previously stated, the Apollo is incredibly intuitive and easy to use. Simply download the UAD software from their site after registering your Apollo, install it and you're good to go! The driver automatically configures the I/O and Low Latency mode in Pro Tools and the Play/Pause controls overlap between the Console app and PT, so there's no switching back and forth to audition tracks. I've been using it for a month now with Pro Tools 11 on a mid-2011 Mac Mini and I have experienced nothing but flawless performance in OSX Mavericks. In this price range, I feel the quality of Apollo's preamps and A/D converters are unmatched by anything that's not 3 or 4 times it's price. The ability to track with UAD plugs, particularly dry and wet signals simultaneously through some clever routing in the Console app, is also a huge coup and one that goes a long way to bridging the analog and digital domain. Most importantly is the ability to turn it on, plug it in and record with flawless performance and uncompromising sonic quality. Nowadays, with DAWs like Pro Tools and Audio Interfaces like Apollo all within consumers' budgets, it's perfectly feasible for the home recordist to achieve professional recordings on their own, which could be brought into a professional studio for mix down without the need for re-recording. In other words, technologies such as these have empowered a new era of independent musicians. -UAD plugs can be viewed as either a best life decision or a slippery slope...it's a big investment that will put off some, but if you're already a UAD user and own a lot of their plugs, welcome to your next frontier! -Only two additional mono outputs, meaning outboard routing capability is minimal and may be a turn-off for those looking to use analog summing devices, like the Dangerous D-Box. In this case, you should look at stepping up to the full-size Apollo Duo or Quad. -Only one Headphone jack for monitoring. Two would have been really nice, like on competitive interfaces from Focusrite. -Only two preamps...after getting a taste of unison technology, you'll wish you had more! - Only available with a duo core, DSP processor...Considering the DSP hit of the newer UAD plugs, four-cores could be easily used, even in this small footprint.